Lisa Lynne: Celtic Harp, Ukranian Bandura, Bouzouki, Guitar & Bass. Cittern, Hammer Dulcimer, Celtic Harp on tracks 7,9 & 11. George Tortorelli: Bamboo Flutes, Whistles, Recorders, Guitar on track 12. I know when I was growing up, I loved looking at the liner notes of the albums I owned. I always wanted to know what was behind the inspiration of the album and every song.. and I have missed that with artists now. Because of the small CD covers, and more so as people are getting their music by download. So here is my attempt to share a bit more about this recording. This album is so special to me, I have a lot to say about it. 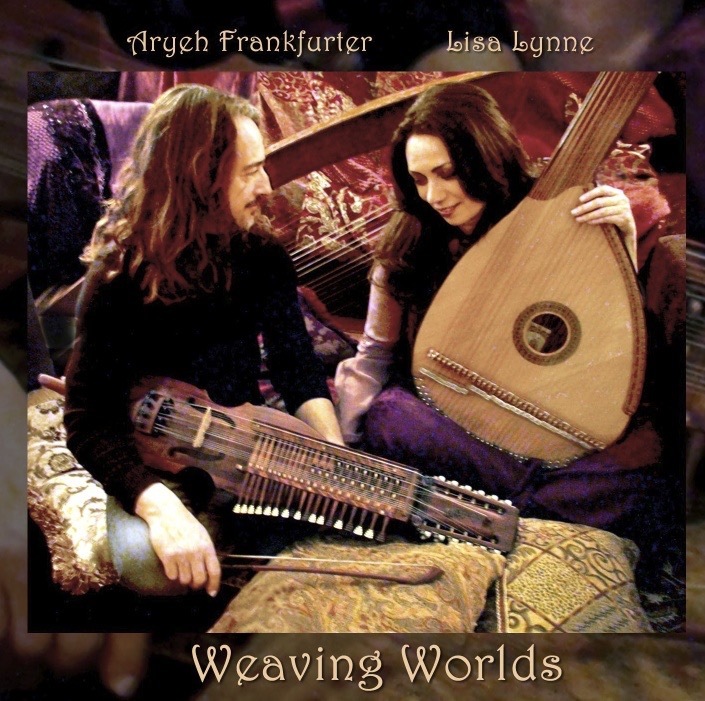 “Weaving Worlds” is the second full collaboration of Aryeh and myself, and also features another of my favorite musicians in the world George Tortorelli. Our first CD is called”Two Worlds One” George is my longtime music partner and we have been performing, touring and recording together as a duo and in groups since 1997. George lives in Florida where we tour often. For those of you familiar with my previous recordings you have heard him often as he has been featured on just about everything I have done for the past decade. He is a wonderful musician and dear friend/brother as well. This recording was the first to put my favorite musicians together and I couldn’t be happier about that. I was a major fan of Aryeh’s music long before we met, and finally we are able to merge all of our efforts together in one place. Aryeh and I play all the instruments you hear except the flutes played by George. Our combined instrument collection is vast, and we feel so lucky to have so many tools to make this music. So what is it like on a typical recording day? We’ll, because of the advances in technology, home recording studios have the capability to record as high quality as professional studios. I have been in many high end studios in my day, and when I compare our current home studio recordings to my expensive pro studio recordings on Windham Hill Records, you cannot tell a difference. I do have some excellent microphones (those were quite expensive) Aryeh has his own recording gear and can run pro recording computer programs. I wont bore you with those details, my eyes glaze over when the talk turns to gear, but it suffices to say, between my gear and Aryeh’s, we have quite a good setup. Our studio basement is totally sound proof, so we can record anytime of day or night. Aryeh likes to record early. Earlier than me, so a typical morning would be quick toast and tea and at 8:00 AM we get going. Me with my second mug of tea, sitting there blurry eyed and grumpy until the heater kicks in. San Francisco mornings can be quite chilly. When the room warms up, the tuning begins. That is the most tedious part of recording. All our instruments, all our strings.. temperature changes, the tuning has to be perfect for recording, so often it takes multiple tries. Sometimes you are minutes into a perfect take, and you have to stop for one note being out of tune and start over. Sometimes digital information gets lost or corrupted for some bizarre technical reason, hence you may hear some rare-but-salty-sailor-talk from Aryeh. Its challenging to say the least, when your all warmed up to play, filled with inspiration and ready to rock, but that one note goes sharp or flat so you have to start all over again, tuning note by note. Finally the music starts happening and the ideas fly. We get thrilled about some parts, we debate others. I might play a tune three times through and we choose the favorite, sometime we have to make choices between technically perfect takes or imperfection but with more vibe and feel. To find the balance is key, to capture what is real, combine our years of experience and hope that the finished piece conveys what we meant to say. The new tracks get listened to upstairs on all different stereo systems. Aryeh likes to go back and work on string parts by himself and play them for me when he’s done. Then I say, “its too much, or its beautiful, or its too weird.” Eventually we find the place where we are both happy. After a few months of this.. We move on to final mixing in a bigger studio. Most of the mixing is done by Aryeh at our place, but we need more specialized outboard gear, and so several days are spent going back and forth to nearby sound studio in San Francisco fine combing the details, the balances, the levels of solos, go home and listen again, go back and tweak a little more. We can get quite caught up in the tiniest details. Then comes audio mastering and that is key. That is where we spare no expense to get the highest possible fidelity and clarity that technology has to offer. We send the finished project for post production to Bernie Becker’s Mastering studio in Pasadena, (near LA) Mastering is taking all the elements, boosting the volume, creating a sparkling sheen on the overall sound, making sure everything is even and clear and bright and warm as can be. Bernie Becker is a legendary guy, and the nicest man ever. He and his son Dale have worked on every recording I’ve done for years. Meanwhile time to decide final titles and names and figure out the artwork. I found a wonderful artist to design the cover and make elfin versions of all the musicians. She also designed the poster that we sell at concerts (below). Next come the credits (my job) send all the images and text off to our groovy graphics guy John, and finally manufacturing.. So.. in about nine months total (same as making a baby) viola.. you have it. Then comes the promotion (also my job) so a whole new set of activities happen around sending it out to radio stations, retail outlets, press releases, setting up concert performances.. the list is long. At this point in time Aryeh runs away and hides…he has already put in countless hours in the technical parts of the record, so I take over from here mailing packages, creating promo materials, sending links..etc, etc. .. Aryeh is already back in the studio working on his next music! In this day and age, the way the music industry has changed, its more often independently done in-house by the artists themselves. I have experienced many different levels of album releases, some were big time with lots of people and help, and money. And some on my own label, humble and modest. This one is somewhere in the middle. You do the best you can, give it all you’ve got, and send it out in the world, hoping it does well, and is happy. But in this case we hope it makes people happy. We hope it makes them feel what we feel.. the love and reference for the instruments and sounds, the music that comes into the heart, out of the hands..hopefully into other hearts. When we start hearing back the wonderful comments from the listeners, we breathe a collective sigh of relief that all that work and dedication, wisdom, faith and perseverance, debate, devotion, and even a few tears, (or was that beers)… was more than worth it. I’ll say a little about each song on this recording. 1. Aurora Borealis: This is one of the oldest compositions on the recoding. I wrote it about fifteen years ago. It first appeared on my album “Moonsongs” released around 1994. It has always been a favorite tune and Aryeh wanted to give it another day in the sun. So we re-did it featuring his Swedish Nyckelharpa, and Georges flutes, added guitars and various strings. This song was written so long ago, I was playing bass in a Top 40 bar band (which is how I supported myself in my 20’s), I was trapped on a really long and pretty awful tour, it had gone on for six weeks in Alaska, and it as a particularly rough and depressing club in Fairbanks. The whole time in Alaska, I was studying books about the Northern Lights with grand hopes to see them, I waited outside every freezing night but they never showed up. I was really sad and miserable and wanted to go home. Finally, the band actually got fired from the tour, and released from our contract. I was so happy, I was going home the next day. And that last night, sure enough, out came the Aurora Borealis in all their glory. I was so happy there were even tears freezing on my face. It was like a message from God, full of breathtaking beauty, and mystery, and hope and promise and certainty of better times ahead. So I wrote this tune on the harp when I got home, its been with me ever since. All of it. 2. A Fond Wish: I wrote this in the hallways of Kaiser Permanente hospital where I played my harp weekly in the intensive care unit. I always had my little digital recorder with me in case I have an inspiration. Too many times I write something new that I love, and you’d think I’d remember it later, but .. not. So the original recording of this song you can hear nurses talking and carts being wheeled by. But it made it to Aryeh’s studio where we recorded it from scratch. We originally were going to put it on George and I’s recent CD called “Light in the Wood” so we were finishing it with Georges flutes in a hotel room. George has a traveling pro recording system so when we need tracks from him, we can do it from the road, we both sit there with headphones on, and the mics and machines set up. If a shower goes on in the next room, we have to wait. But it gets done, the tracks fly across the Internet to Aryeh who edits them and places them in the right spots. Aryeh loved this song so much that he said “pleeeeese” can we save it for our next recording instead? Who can say “no” to that face. Not me. So here it is. I’m glad we waited because the Nyckelharpa and production he added is wonderful. 3. Interlace I – We both love interludes, I call them inter-nudes. Every album we always wanted to put some in so this album we finally did. Short pieces that are just one mood or musical thought. This one was all Aryeh, he sometimes does soundtrack work and this was one of the pieces he submitted for a documentary. Aryeh is playing the hammer dulcimer, which he does quite well in my humble opinion, although he would beg to differ and always does. I added some hypnotic Irish bouzouki, (have those words ever been used in a sentence together?) Anyway, Its a mysterious mood that we liked. 4. Bandora’s Box – Another example of Aryeh digging around my old music and wanting to do a revised version that can be enjoyed again now. This song was originally recorded on my album for Windham Hill called “Seasons of the Soul” Back then, I thought synthesizers were cool, and now I prefer all natural acoustic sounds, so we did it all organically you could say. It was the first song written on my Bandura, a Ukrainian instrument that you see on the cover. It was my very first bandura, an antique, but now I have a brand new one that is actually made of fiberglass on the cover photo. The fiberglass is a great help with stability and tuning. When you listen to this on headphones, its quite a journey. 5. Interlace II – Another creation of Aryeh, he played my older Bandura on this one. I added some new Bandura and Bouzouki, George did his low whistle in our studio while in town to do some gigs with me. This is one of my favorites. A good example of .. less is more. 6. My Lagan Love – This is a classic traditional tune from Aryeh’s repertoire. This one was really his baby that he did all the lush arrangements you hear, and played most of the instruments. He likes those tricky chords and there was some tricky moves for the harp to do, lever flipping and out of the key signature notes. We also perform this song live when we play with legendary harper Chris Caswell. He sings some incredible lyrics on that version, called “The Quiet Joys of Brotherhood”, a highlight of our shows with Chris. On this instrumental version, George is playing his handmade bamboo flutes that he makes from bamboo he grows in Florida. 7. The Lea Rig – Another traditional piece taught to us by Aryeh. Actually when I first met Aryeh we were learning each others music, and this is one of the first songs we performed together. We still play this often live. Aryeh originally recorded it on his “Harpers Brew” album, which is his solo harp work. On this version the starting instrument is me playing the Irish Bouzouki, then Aryeh comes in with the harp. His harp sounds incredible on recordings. He plays a Dusty Strings harp. I play Triplett harps. Both are excellent harps. George is playing low Irish whistle. 8. Interlace III – All Aryeh’s wonderful work, his strings, cello, violin, viola, Nyckelharpa. He is a wonder, an International man of mystery. 9. Eliz Iza – A traditional piece that Aryeh loved, and it was one of the first Celtic songs he learned on the harp. Actually he was going to do it on his first solo Nyckelharpa recording, but he played it for me on a beautiful drive up the 101, and I said “pleeeeeese” save it for our next CD together, and so he did. So I guess we are even. 10. Roundelay – This piece Aryeh and I wrote together. I remember exactly when. It was rather early in our friendship, and we brought our instruments to Golden Gate park on a beautiful sunny day. Spread out a blanket and commenced just jamming on the Irish Bouzouki and Nyckelharpa. Out came the main chord progression that I have been carrying around with me forever and had never made anything of it. I still have the recording from that day in the park. It was to say the least..pretty magical. When we perform this in concert we use just the bouzouki and the Cittern, so its a very full double mandolin type sound. We break up the song into parts, and every part we slow down and tell part of a story. The story of how we met, its really funny and the audience cracks up everytime. I’ll post a video of that soon from a recent concert. 11. Autumn Waltz – Aryeh is a wonderful composer, arranger and producer. He specializes in arranging traditional music and instruments and bringing them into the now. He says every ten years he writes a tune. But when he does its a doozy. He is constantly creating all kinds of things, he is writing all the time in one way or another. He recorded a version of this tune on one of his earlier CDs called “Midnight Muse”. We play it live too. We both can play it on a number of different instruments, so we can do it all different ways. 12. Interlace IV – This was a rare outtake that George and I recorded in Los Angeles. Most people don’t know that George and I were rock-n-rollers playing guitar and electric rock bass as our primary instruments in our younger incarnations. This was one we just spontaneously did when we were working on something else. George played guitar and I played bouzouki, and it just clicked, and Gil the engineer wisely hit “record” We later added Aryeh’s Nyckelharpa and some flutes to it. Its one of my favorites too. 13. Whisper – This is a song I composed on that same day in the Kaiser hospital. Sometimes a whole bunch of new tunes come out at once. A litter of tunes! This was such. Its kind of that classic sound that we love to do. Its so simple.. but it works and is a favorite concert moment. We recorded the flutes at Georges house in the forest of Northern Florida, and the rest in our own studio. Its a perfect example of how.. the notes you don’t play are as important as the notes you do. 14. A Bountiful Life – One day Aryeh said, “we need one more song that’s in a major key that’s not too slow, so write me a song, woman” he challenges me, (but in a good way). So I sit at my desk with all my tools and do something that makes me feel happy. I show it to Aryeh and it alas, it makes him happy too. We work and work the chords to get them just right, and get a few new clever ones in there too. It seemed like a perfect way to end the recording. It reminds me of a feel good, all together now sort of tune. We play it in concert too.